It’s amazing how quickly the tables can turn within a week of hockey. We hockey writers like to dig our hands into stories that play out on and off the ice. That’s why Listerine will probably air a commercial starring Carrie Underwood for their new catfish flavor any day now. It’s also why Peter Laviolette has to field questions about a non-existent goalie controversy. Less than a week ago, the Nashville Predators were adding more questions than they were answering. After Games 1 and 2, we all saw a Nashville team that looked frustrated and maybe a little surprised. We also saw an aging goaltender hurtling back down to earth due in part to a wall of defense suddenly crumbling before him. At least, that’s what we thought we saw. As it turns out, this Predators team never left. After two masterful wins in Nashville, they found their confidence again, and now the tables have turned for Game 5 in Pittsburgh. All the questions the Predators were forced to answer after Game 2 have now been heaped on the Penguins. 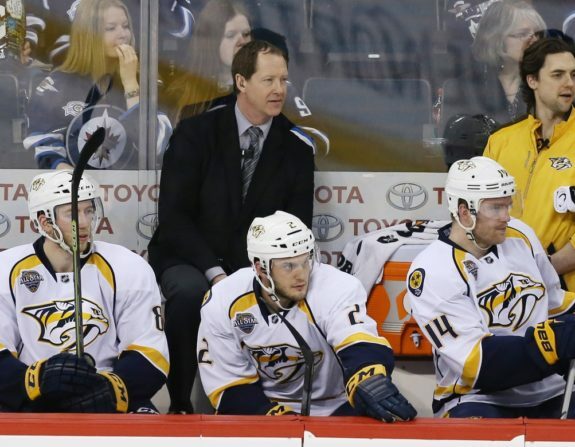 How will they stop Nashville’s relentless forecheck? Where has the offense gone? Will Matt Murray start Game 5? To win games, you have to be able to make the big plays. The Predators have been controlling the game play throughout most of the series, and yet, when the moment arrived, it was the Penguins making the most out of the few opportunities that were handed to them. The Pengsins didn’t have to dictate the play. They just had to remain patient. Now, with the defense locking things up on the back-end, the Predators have been the ones making plays and finishing them, which is something they didn’t do in Pittsburgh. The third Nashville goal by Viktor Arvisson is a perfect example of that. Roman Josi, who tallied his first goal of the series in Game 3, moved the puck up the boards in his own zone to a tangled up James Neal. Neal then shoves the puck to birthday boy Mike Fisher, who makes a diving, one-handed pass to a flying Arvidsson who got behind the Penguins defense and put an exclamation point on a brilliant play. Coming into the Final, I wasn’t sure if the Predators would be able to sustain enough offense without the high flying Ryan Johansen, who had 13 points in 14 games, leading the way. Yeah, they were the hottest team, but they weren’t the best. How much could the defense prop them up? Plus, the Penguins had experience on their side, and based on Games 1 and 2, a little bit of puck luck too. It seemed that in order to beat this Penguins team, the Predators would have to be perfect. Playing a few good periods wasn’t going to cut it. Nashville Predators goalie Pekka Rinne (35) eyes the puck as Nashville Predators defenseman Yannick Weber (7) defends against Pittsburgh Penguins right wing Carter Rowney (37) during the second period in game four of the 2017 Stanley Cup Final at Bridgestone Arena. The answer was simple: Johansen was never their best offensive weapon…it’s been the defense all along. If they could just get their defense clicking again, the other pieces of the Predators’ jigsaw would fall into place. As the series went to Nashville, that’s exactly what happened. Give all the credit to Phil Housley (who is chasing his first Stanley Cup) and the coaching staff, who have kept this defensive core on an even keel. Games 3 and 4 in Nashville were nothing short of spectacular. The defense has kept the Penguins stars quiet and frustrated. Sidney Crosby and Evgeni Malkin couldn’t even muster one shot on goal in Game 3, and in Game 4, only Crosby was able to put one past Pekka Rinne. Phil Kessel, Patric Hornqvist, Jake Guentzel and Chris Kunitz were each kept in check (literally). The defenseman for the Predators have also played smart, pinching in where needed. They’ve allowed their forecheck to stay aggressive, which is part of the reason why the Penguins had so many issues generating offense in Nashville. 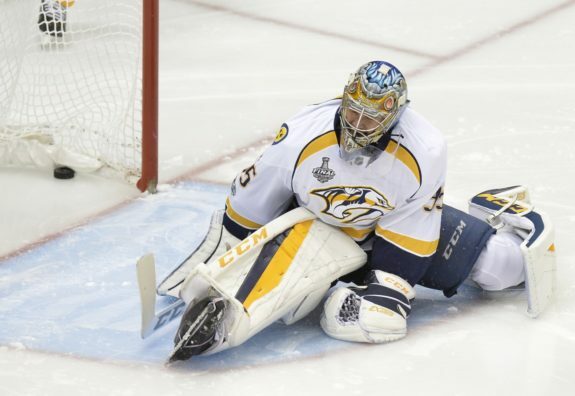 The biggest relief for Nashville, however, should be that Pekka Rinne has found his game again. He hasn’t had to be perfect, but the home cooking in Nashville has allowed him to play with confidence. It’s fair to say he’ll never reach the level of play he achieved in Round 1, but on Monday night, he was pretty close. That second period rally by the Predators doesn’t happen if Rinne fails to make a couple of clutch stops. Early in the second, Kunitz found himself on a breakaway, and Rinne stonewalled him. A few minutes later, Rinne was involved in a sequence in which he made two saves off another Crosby breakaway. With the net empty and chaos ensuing in front of the net, Guentzel had a chance to bury the puck, but Rinne made a huge diving save to keep it out of the net with his blocker. It’s the kind of play that could not only save a goal, but save an entire series. So the question is, which Preadtors team will show up Thursday in Pittsburgh? It’s clear that this is their series to lose. While the city of Nashville has been the star of the show in this series, the Predators are going to have to find a way to win without them. The Stanley Cup is for closers, and they’re going to have to step up with a different shade of gold surrounding them. The first away team to win a game will likely emerge as the champion, and should they win in Pittsburgh, the Cup may make it’s first appearance in a city that’s been starving for a championship. If the defense plays the way it should, everything else will fall into place. The only lingering question they’ll have to answer at that point is which Johnny Cash song will P.K. Subban be singing once this is all over?